Roller locks: when are they used? When we talk about locks we must take into account the fact that there are many types. In effect, depending on the type of installation either on or inside the door, the locks are identified as either rim or mortise locks; depending on the number of closure elements they can have one or more latches, one or more deadbolts, or both these elements; according to the shape and type of closing movement, the deadbolt can in turn be of the rotating or swing hookbolt type; depending on the type of activation, the locks can then be manual, electrical or electronic, etc. Each type is suitable for a specific use and for this reason it should be chosen with care. When should the “roller lock” type be installed? As was pointed out in a blog some time ago, rim locks differ depending on which side of the door they are to be mounted. Looking at the door from the side opposite to that on which the lock must be mounted, if the hinges are on the right the door is conventionally referred to as a right-hand door. In this case, it is necessary to mount a right-hand lock. On the contrary, if the hinges are on the left, it is a left-hand door and the lock must necessarily be a left-hand version. Example of Viro rim lock. This is not the same, however, for mortise locks, as they are inserted inside the door. However, attention must be paid during assembly to the inclination of the latch, which, when the door is closing, must enter the counter-plate on the door jamb. For this reason it is important that the latch of the mortise locks is reversible with a simple operation, in order to best adapt both to doors which open by pulling and those which open by pushing. 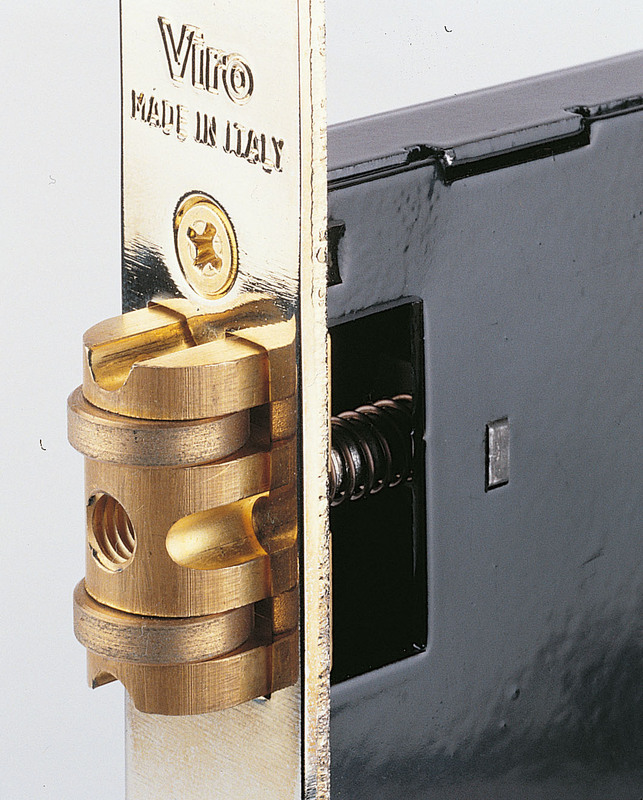 Example of mortise lock with Viro cylinder. The choice of installing a roller lock is dictated by the need to have a door which opens in both directions by pushing. The purpose of the roller is to facilitate the opening of the door in the two directions, sliding, under the thrust received either from outside or inside the door, on the two flaps of the counter-plate without ever locking (unlike the latch which, once the door is closed, requires a handle to be withdrawn and to ensure that the door can be opened again). 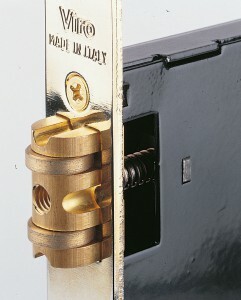 Example of the Viro roller lock. In order for the door to open in both directions, the protrusion of the roller from the lock plate must be adjusted during assembly, in such a way that, depending on how the door has been mounted, the distance from the counter-plate is precise for operation of the mechanism. In the case where the door and jamb, and consequently the lock plate and counter-plate, are too close, the roller should be screwed, to move it towards the plate. On the contrary, if they are too far away, the roller should be unscrewed, so that, by moving out, it approaches the counter-plate. 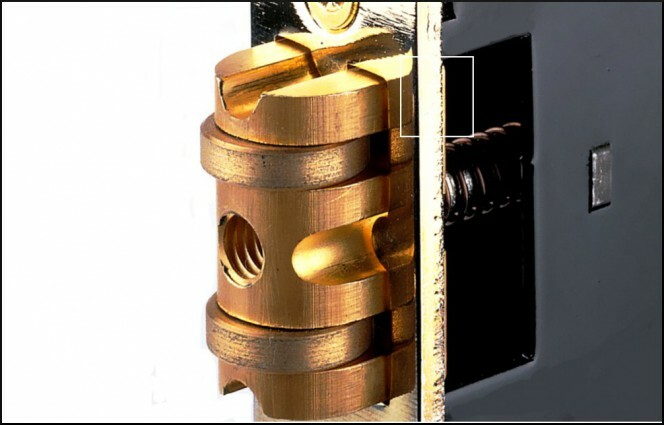 If we choose to install a roller lock rather than a latch type, we must also remember that there is no handle in this type of mechanism (as there is no latch to be withdrawn) and that, in order to close the door, it is necessary to make use of the bolt, which protrudes according to the throws that we give to the cylinder inserted into the lock and, inserting in the specific slot of the counter-plate, prevents the door from opening. 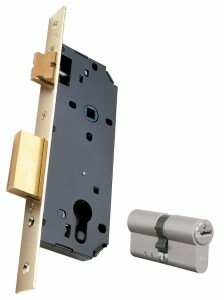 As we have already mentioned at the beginning of the blog, the choice of the lock always depends on its use. It is unlikely that a roller lock would be chosen in a private setting, especially for a room where they are valuable items to be safeguarded. It is more likely that a mechanism of this kind would be chosen within an office or a public place, for example for the access doors to corridors and / or service rooms, so as to facilitate the entry and exit of employees. More generally, it would be chosen in all the situations where the convenience of pushing opening in both directions is functional for the particular context. This entry was posted in Locks and Cylinders and tagged products, tips on 16 February 2016 by calessandrini.